MACON, Ill. – Here’s a good idea for a holiday weekend. Take a friend, neighbor or somebody from work for their first trip to Macon Speedway, and don’t forget to bring the kids. On Saturday, May 24, it’s an especially great night for families. 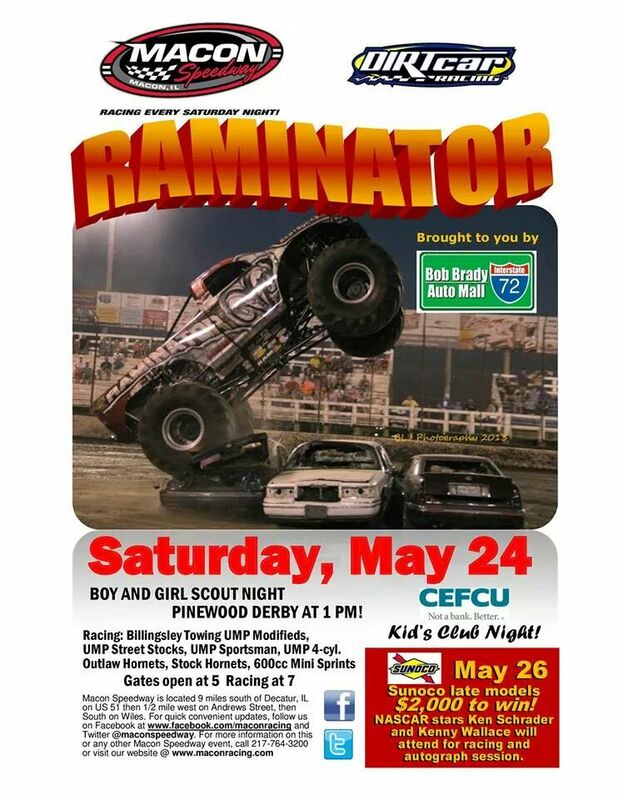 Bob Brady Auto Mall Raminator Night features the Raminator monster truck in a car-crushing exhibition in the infield during intermission. The 10,200-pound beast with 2,000 horsepower from the Hemi engine will smash those cars flat while showing off tricks and stunts learned from years on the Monster Truck Racing Association tour. Raminator will also be available for photos before the show. That’s not all. It’s Scout Night, so boys and girls in their scout uniforms are admitted free. We’ll also admit the scout masters for free, so bring your pack. The Pinewood Derby is at 1 p.m. at Macon Speedway. Every little race fan needs a souvenir. So Macon Speedway will distribute a free checkered flag to the first 200 kids 11-under tonight. Get there early while supplies last. And, let’s not forget, Macon Speedway is known for its exciting, wheel –to-wheel racing. Seven classes will race tonight, including the Billingsley Towing Modifieds and the Beach House Mini-Sprints. Street Stocks, Sportsman, Outlaw Hornets, Stock Hornets and B-Mods will also go door to door to bring the fans to their feet. Gates open at 5 p.m. with racing at 7. Macon Speedway has plenty of great food at the concession stand, featuring steak sandwiches, Heinkel’s polish sausage and turkey drums, cheeseburgers, popcorn and snow cones. Hickory River barbeque is located next to the main beer stand. If you want to get a look at Raminator earlier in the day, it will appear at Bob Brady Auto Mall in Decatur from 11 a.m. to 2 p.m. There’s also a live remote with 95Q, and take a chance to get in the It’s hot, Bob commercials with Bob Brady Auto Mall. On Monday, it’s the Sunoco American Late Model Series for a $2,000 to win race that will draw stars from the Midwest. On NASCAR Night of Stars, Ken Schrader and Kenny Wallace will race modifieds. Gates open at 4. Racing starts at 6.